evidence that they ever existed? could demonstrate how it might have been done. 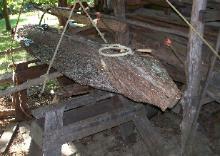 proceeded to try on June 26.
spreaders and lashings to hold the shape of the craft. under the protection of the shop shed. were ready to set it aside for a new start the next day (Saturday). 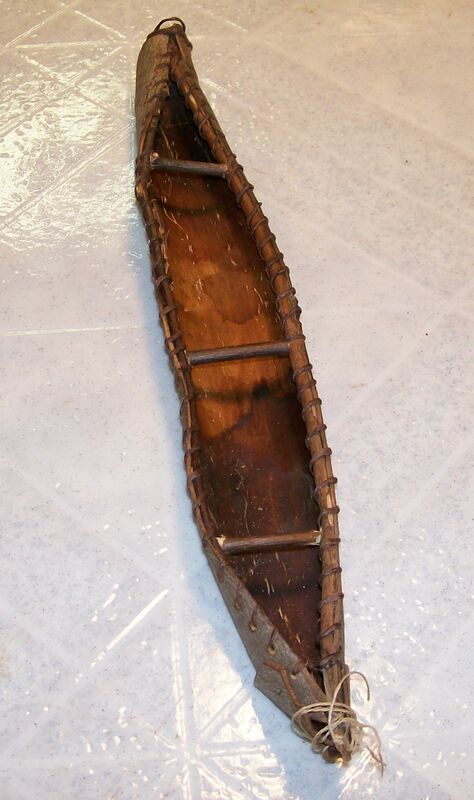 under bark flap drawn up and around the sides without the devilish gunwales. under the shop shed roof, secured the work site and left. 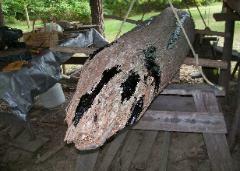 circles to open the bark, removing the bark and folding and sealing the ends. After 30 days drying out. 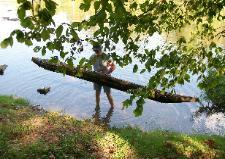 adhered to the wood of the tree and almost impossible to separate. available for the return crossing. had split more bottom area. Forcing the bark curls straight simply wasn't an option. 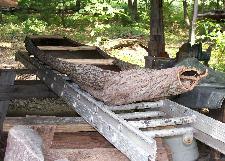 The bark would split before it straightened. quarter inch polypropylene twisted rope, and I sealed with troweled on roofing tar. likely ever to produce the proof. 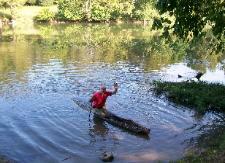 Shenandoah, about two miles, September 22, 2007.
the hickory log we had left after the canoe bark was removed.